Seeking to eliminate the error-prone and labor-intensive process of manually encoding, printing and applying adhesive-backed paper labels to secondary packaging (corrugated cardboard boxes), a cosmetics manufacturer looked for a direct carton marking solution. Matthews Marking Systems implemented a thermal ink jet on-demand case coding system, controlled by the MPERIA® marking and coding automation platform, to imprint the company’s logo, product information, expiration and lot coding on each case. The company reduced their annual consumables and labor costs by $15,000 to $20,000, and achieved a full return on investment (ROI) in four months. To completely eliminate labels, label waste and their associated manual application, Matthews implemented the MPERIA® automated marking and coding platform, combined with an easy-to-use VIAjet™ L-Series thermal ink jet (TIJ) printing system, to imprint information on-demand directly on the cartons. Outfitted with an L50 2-inch (50.8 mm) tall printhead and cartridge-based ink supply, the L-Series printer is mounted on the operation’s existing case sealer. As directed by MPERIA®, the printhead marks all required information—product data, quantity, best by date, lot code and company logo—directly on each corrugated box at a high resolution of 600 x 600 dots per inch (25.4 mm), matching the quality of the labels previously used. Marking occurs immediately upon each box’s ejection from the case sealer at rates up to 10 boxes per minute. 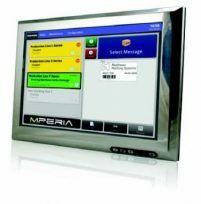 Instead of an encoder, the MPERIA® platform allows an operator to easily select the appropriate pre-programmed data format, eliminating errors due to incorrect input of information. It also supports marking in multiple languages, and enables message creation, selection and printing without any special operator training. Further, MPERIA® supports any future production increases, easily supporting the addition of more printheads should throughput levels grow. 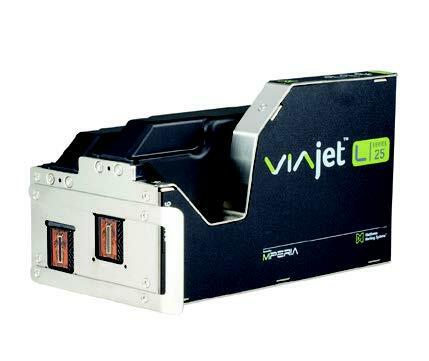 The VIAjet VIAjet™ L-Series printer’s only maintenance requirements are routine ink cartridge replacement to refill its ink supply (a process that takes between 10 and 20 seconds) and an occasional cleaning. Installation took less than a day. With the new Matthews MPERIA®-driven thermal ink jet system, the manufacturer was able to completely cut the cost of the labels, the space needed to store them, their associated waste, and 95% of the manual labor needed to encode, print and apply them. Because the MPERIA® system automatically and correctly generates the codes marked on the corrugated boxes, with no operator input required, the downtime and label waste previously associated with the process was also eliminated. The company estimates that the new system saves them $15,000 to $20,000 annually, and achieved a full return on investment (ROI) in four months.